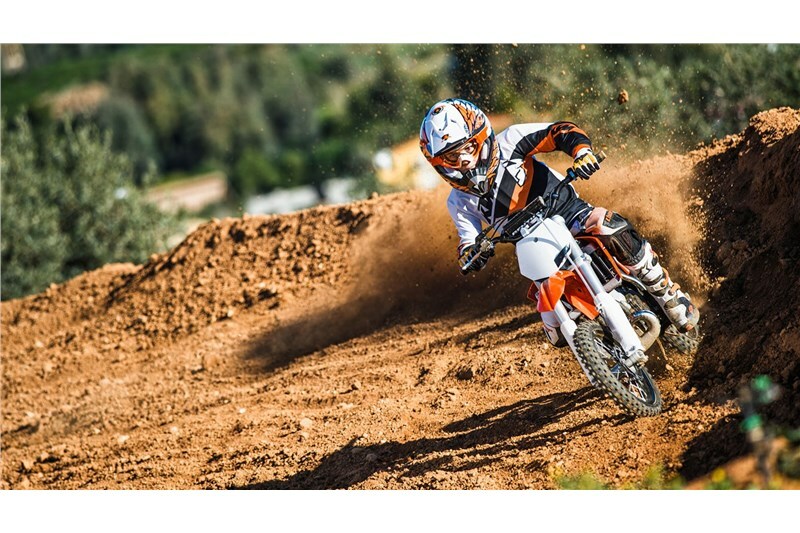 A real KTM for young racers with high quality components that's easy to control and whose engine excels with linear power development and a beginner-friendly automatic clutch. 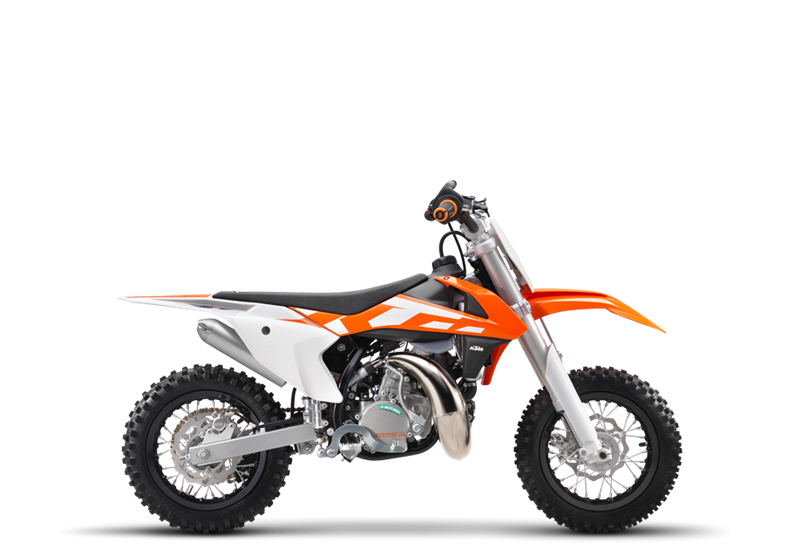 ADJUSTABLE AUTOMATIC TRANSMISSION The centrifugally controlled, multi-disc automatic clutch developed by KTM delivers easily controllable acceleration and makes riding the 50 SX Mini the easiest thing in the world. Furthermore, it can still be quickly and easily adjusted to the specific requirements of both track and rider using the "KTM clicker system" - in a matter of seconds and with no special tools required. WP CHASSIS A high quality, upside-down telescopic fork from WP Suspension, featuring 35 mm diameter outer tubes and 100 mm suspension travel, ensures outstanding ride stability. A WP shock absorber connected directly to the swingarm also supplies 171 mm of suspension travel at the rear wheel. SUSPENSION/DAMPING Both the rear shock absorber and the 35 mm upside-down fork are high-quality products from WP Suspension and provide ultimate damping and responsiveness. ENGINE The modern, extremely compact, 2-stroke engine sets the benchmark in its class with its very controllable power. Thanks to the 3-shaft concept, the crankshaft is close to the bike's center of gravity. This not only benefits the handling; it also provides a flow-optimized inflow angle at the intake membrane - a prerequisite for maximum performance. OPTIONAL RESTRICTOR KIT For absolute beginners, the engine power can be restricted to a moderate 5.5 hp with a kit from the PowerParts range. 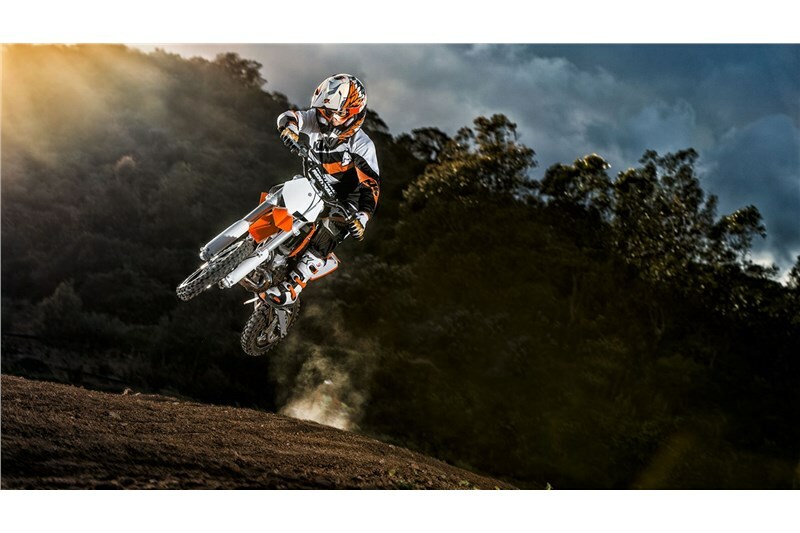 CLUTCH The centrifugally controlled, multi-disc automatic clutch developed by KTM delivers easily controllable acceleration and makes riding this bike the easiest thing in the world. It can be adjusted in no time at all, without special tools, to the specific requirements of both track and rider. RADIATOR Just like the big KTM bikes, the 50 SX Mini is also equipped with water cooling that even cools the crankcase. Generously dimensioned radiators ensure excellent heat dissipation and therefore high reliability, even under extreme loads. HANDLEBAR The ergonomic Renthal handlebar made from a high-quality aluminum alloy ensures the highest levels of stability and safety. A Renthal crash pad around the center brace protects the rider from hard knocks. GRAPHICS The graphic design derived from that of the full-size SX bikes makes the little KTM even cooler. Its frame has a hardwearing plastic coating in anthracite metallic.